Timmy is our main man here at Cove Creek. He carries great presence with his strong powerful movement and fabulous show temperament. 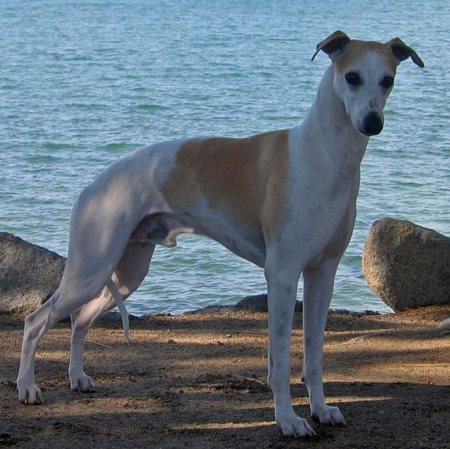 Timmy stands 21 inches in height and is a balanced stallion of a whippet. He has that gorgeous head and soft whippet expression we so love. Always owner handled, he quickly finished his Championship in tough west coast competition from the 6-9 month puppy class. In just a few weekends out he was ranked as a top twenty whippet during 2003. Timmy is now making his mark as a stud dog. He has produced multiple champions as well as a top twenty whippet. 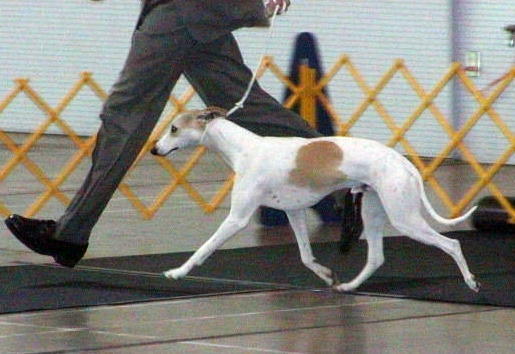 He is shown winning the American Whippet Club Western Specialty. Owned by Karen Cosgrove and Cove Creek. Timmy at the 2004 National Specialty in Greensboro, North Carolina. Winning the Award of Merit at the 2005 AWC Western Specialty in Lompoc California. Best of Breed at the AWC Specialty weekend in Ft. Worth, Texas at thirteen months old. Award of Merit at the American Whippet Club Regional Specialty at one year old. Three month Timmy with daddy Nova. On the move in the Group at one year old. Finishing his Championship at the prestigious Del Valle Kennel Club supported entry show from the 6 month puppy class.